Step 1. Place stock and 2 cups cold water in a saucepan over high heat. Bring to the boil. Reduce heat to low. Simmer until needed. Step 2. Meanwhile, heat half the oil in a large, heavy-based saucepan over medium-high heat. 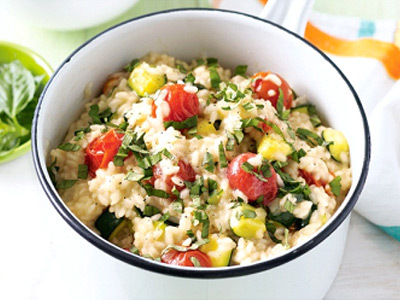 Add zucchini and tomatoes. Cook, stirring, for 2 to 3 minutes or until lightly browned. Transfer to a bowl. Heat remaining oil in pan. Add onion and garlic. Cook, stirring, for 2 minutes or until softened. Add rice. Cook, stirring, for 1 minute. Add lemon juice. Bring to the boil. Step 3. Reduce heat to low. Add 1 ladle of stock mixture to rice. Cook, stirring with a wooden spoon, until liquid has absorbed. Repeat with remaining stock, 1 ladle at a time. Add vegetable mixture to rice mixture with last ladle of stock. Cook for 3 to 4 minutes or until rice is tender. Remove from heat. Stir in basil and cheese. Serve.